Planning and executing community newspaper campaigns with one call and one invoice. 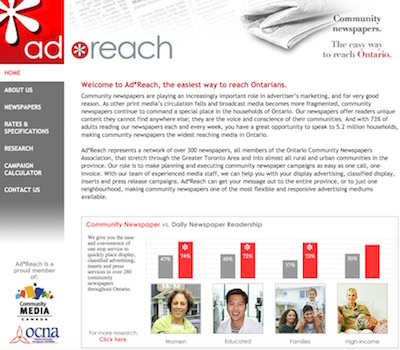 Ad*Reach represents a network of over 300 newspapers, all members of the Ontario Community Newspapers Association, that stretch through the Greater Toronto Area and into almost all rural and urban communities in the province. Our role is to make planning and executing community newspaper campaigns as easy as one call, one invoice. Our newspapers offer readers unique content they cannot find anywhere else; they are the voice and conscience of their communities. And with 73% of adults reading our newspapers each and every week, you have a great opportunity to speak to 5.2 million households, making community newspapers the widest reaching media in Ontario. With our team of experienced media staff, we can help you with your display advertising, classified display, inserts and press release campaigns. Ad*Reach can get your message out to the entire province, or to just one neighbourhood, making community newspapers one of the most flexible and responsive advertising mediums available.